A pressure washer is a serious tool. Damage to property and person can occur if you are careless. Damage from using high pressure can vary from splinters and raised grain to visible lap marks in the wood (these show up more after sealing) Just using a pressure washer without a proper detergent like Restore-A-Deck can also yield unwanted results. The pictures below show examples of a homeowner using no cleaner and just high-pressure water to clean. After you have allowed the oxygenating power of Restore-A-Deck to work its magic, it's time to rinse. While you are at the home center renting your machine, try to have them give you a nozzle which will lower your effective pressure to 800 psi. If you do not have access to interchangeable nozzles, you will need to keep the tip of your gun at 12-18 inches from the surface. Start the flow away from the wood surface and bring the gun slowly into the position to start rinsing. Start at one end of a board and walk your way to the opposite end keeping the nozzle the same distance from the surface the entire way. This will prevent lap marks. If for any reason you need to stop in the middle of a board, start the process from the beginning (at the end of the board) until you pick up where you left off. Take your time and always keep conscious of the distance between the spray tip and the wood. Be extra cautious on spindles. When you are finished cleaning, apply your brightener and rinse. You may use the pressure washer again or a hose may be faster for you. No pressure is necessary during this final step. Note: You may experience some small fuzzies that appear after the wood dries. This is normal to a small degree (especially on cedar). Often times these will dry up and fall away during subsequent rainfall. If you are planning on sealing as soon as is possible, these can be sanded away. Any tips for an Ipe Deck? Need it to be cleaned first. Yes, you will have to clean and brighten for prep. Have a recently stained deck. Need to replace some boards. What is the staining procedure on the new boards? Thanks. I will wait 6 months, until Spring. I have a 25 year old red wood deck. I'm planning on using RAD Stripper to remove old stain. I'm concerned about using a power washer due to the age and type of wood. Do I have reason to be concerned about using a power washer? Not if you use the proper techniques. What would be the proper techniques with pressure washer to avoid splintering? That is in the article on this page. Ours is a new (9 month old) 2x6 PT deck. We are planning on waiting until a full year is up to stain. The wood is not black or dark, so do we need to do the cleaner and brightner and pressure washer? Yes that is correct. You will need Step 1 Cleaner and the Step 2 Brightener while doing the pressure washing. 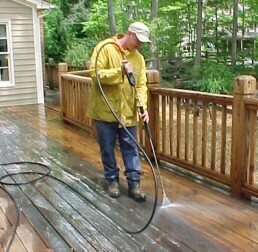 Restore-A-Deck Help for Your Restoration Project! Why Do I Need to Prep my Deck?